When my wife informed me that Neil Armstrong, the first man to walk on the moon, had died this past Saturday, it left me somewhat shocked and in disbelief. To me, Armstrong and his fellow astronaut Buzz Aldrin were and have remained America’s greatest heroes for the past 43 years, ever since their tiny spacecraft first landed on the lunar surface and was consigned to history. I remember the day that it landed. I was just over three years old but my parents made such a big deal of watching the landing that it stuck in my head. A number of conversations with my Uncle Mack, who worked with Werner von Braun on the Apollo program during those formative years helped to cement that memory in my brain and between the two was born a love of all things related to space travel, the moon and exploration in general. Star Trek was born the same year that I was and when it began to show in reruns I became a fan of it because it was the sole science fiction show that was based on the premise that human beings would someday rise above the issues we allow to hold us back today. When Apollo 11 blasted off to the moon in 1969, there was a lot more on that spacecraft than just Armstrong, Aldrin and Michael Collins…. they took with them the collective hopes, dreams, and aspirations of the entire American people….and not just our country but all the people of all the nations of the world, even those in remote places that never knew what was happening. They truly were off on a voyage of discovery that would explore what literally is the final and greatest frontier. Twenty-four people left on missions of exploration to our nearest celestial body, the moon. Fourteen of them were intended to walk on its surface but only twelve actually got to climb down that ladder into annals of history and Armstrong was the first of the twelve to plant his footprint in the lunar soil. One can only imagine what must have been going through his mind as he descended the ladder and made that last step. He literally stood on the precipice of history as he let go of the rail, his last contact with Earth, and for a few moments, he stood detached and apart from every human being alive, the first and only man to stand on an alien world. Being a humble and modest man, he didn’t make a speech worthy of Abraham Lincoln at Gettysburg or even a statement as grand as Douglas MacArthur when he returned to the Philippines…. but what he said summed up every single thing that every man and woman had done in the course of human history to get him to the moment he was at. “That’s one small step for [a] man….one giant leap for mankind”. 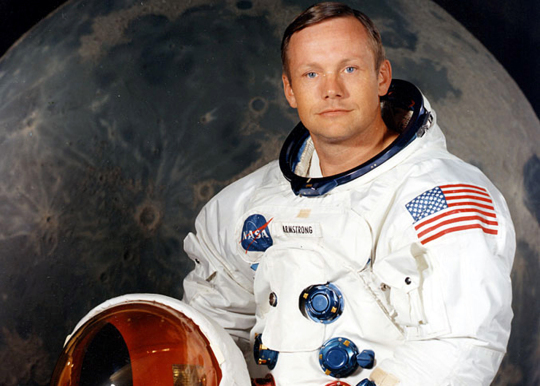 History has shown the bright light of fame and public interest in the direction of Neil Armstrong ever since that day. A lesser man would have crumbled under the weight of such public scrutiny and expectation, yet Armstrong took it in stride, accepting the responsibility of becoming a living legend without becoming jaded, cynical or engaging in a massive ego trip. Perhaps that is the reason that NASA chose him to be the first. Someone along the way realized that Neil Armstrong was the perfect person to accept such responsibility with grace and humility. No one could possibly understand the pressures that were on the Apollo astronauts as they prepared for these great missions of exploration. No one realized the amount of hours in work and preparation that each one had to undergo in preparing for a mission based on a lot of science and very little experience in space travel. It boggles the imagination even today that the amount of technical knowledge and brainpower that was brought to bear in making the Apollo missions possible even could exist 50 years ago when President Kennedy challenged the nation to send a man to the moon and return him safely to the earth. Even as our technology advanced exponentially in those years of preparation, our mission to reach the moon in a spacecraft equipped with less computing power than iPhone and completely reliant on everything working properly could be likened to Christopher Columbus setting out to discover the New World in a rowboat. Each of those men knew that there was a strong possibility they might fail and that death was a close companion throughout. Armstrong knew this most of all because if he failed, it might stop others from trying. He did do it though and others would follow, six triumphs and one tragedy that turned into a triumph for other reason. Apollo 13 reminded every one of us just how dangerous each mission could be and that it wasn’t just a walk in the celestial park. The lunar missions demonstrated the pinnacle of American greatness, scientific prowess, technical know-how and the uncompromising drive to get it done despite any obstacles that might be put in the way. For far too many years afterwards, we rested on our laurels and engaged in mostly uninspiring excursions into space, abandoning the huge leaps we had made to get us where we were in those greatest years of NASA but in 1969, anything was possible and the entire future lay at our feet, starting with the feet of Neil Armstrong. His first steps on the moon were simple impressions made in the soft soil of the landing area but those impressions run far deeper than what they appear to be because they have influenced and fascinated millions since then, including myself. They are footsteps that would be followed by eleven more men over the next few years and someday they will be followed by men and women who will come back to the moon while setting their sights on the next destinations, such as Mars and beyond. As each one leaves their footprints, the path will grow wider, the unknown will become known and the call to exploration will become stronger. They will plant seeds in the minds of the young, some of whom will pick up the torch and head for the stars and all that there is to see and explore, while others, like me, will cheer them on and marvel at their discoveries. For now, a nation and the world mourns the loss of history’s greatest explorer, the first of the twelve who would become the last pioneers of the twentieth century, exploring farther than anyone had ever gone and coming back to encourage us to keep pushing forward and to someday, go back again. Godspeed, Neil Armstrong.